Jonathan Mess is one of my favorite Maine artists. I have written about his work before, but I doubt I could cover all the ideas that his art puts into play even in a book. Yet the Mess show is my first mention of Westbrook’s Saccarappa Art Collective, which is headed toward its first anniversary as a gallery venue. “Landfill No. 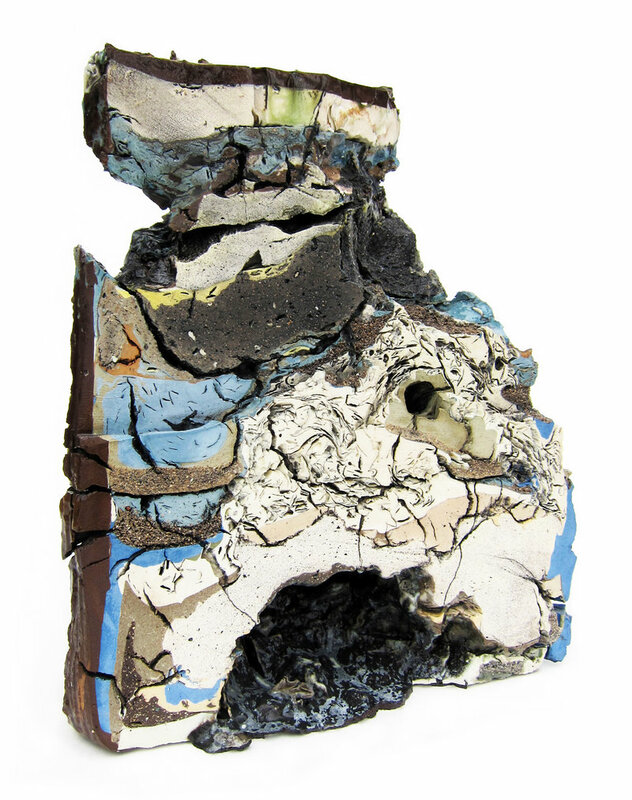 9: Northeast Cross Section,” various clays, glazes and stains; 50 percent recycled. “Large Traces Tile No. 12,” various clays, glazes and stains. “Landfill No. 43: Central Cross Section,” above, various clays, glazes and stains. Art collectives tend to be weird organizations (honestly, though — most galleries are). They might look like many-headed hydras, but they tend to be far more complex, like if each hydra head had multiple personalities. I know little about Saccarappa other than the list of its artist members and that one of them, Andy Curran, owns it. (It’s intriguing.) Their current arrangement is that all the members have works on display along with two guest artists to mix it up: One in the gallery fronting Main Street; the other on the farthest wall (called the “Presumpscot Gallery” because of the nearby river). It’s a good gallery space, featuring long white walls with areas of exposed brick over low and narrow mahogany-colored shelves above white wainscoting. While the current installation approaches critical density (there are well more than 100 works on display), it still acts more like a “white box” gallery than a retail shop. Mess’ 34 works fill the relatively small front gallery. 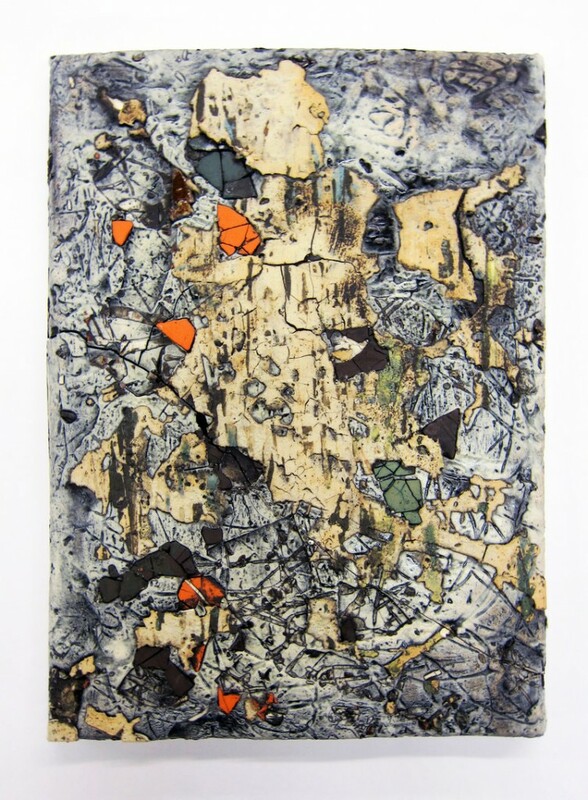 Half of the works are 12- or 15-inch ceramic slabs (Mess calls them “tiles”) hung like paintings. And while they differentiate themselves sufficiently from the brick wall, the mat slabs don’t leap out as they usually do from solid white walls. I like this effect, especially since Mess’ slabs usually act like the unruly child versions of paintings. 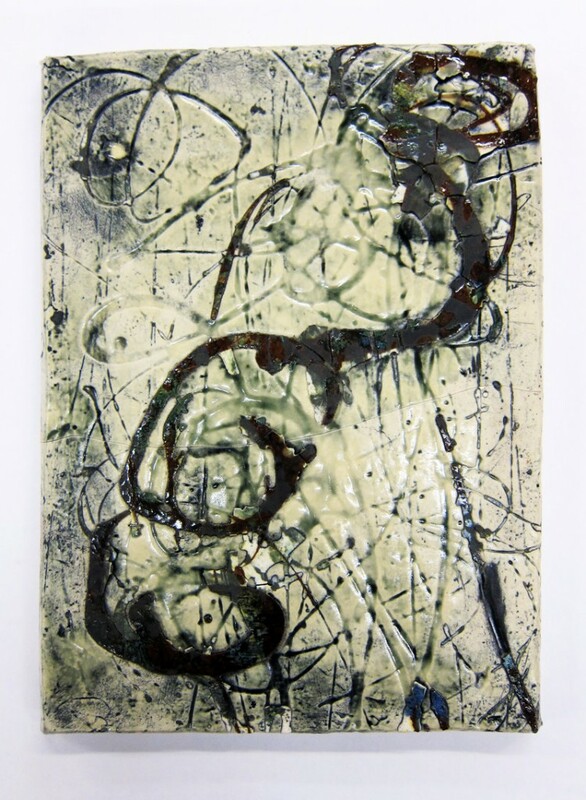 Their lines are wild, and their surfaces are varied and thickly textured with glazes, slips, fissures and irascibly independent materials that refused to be melted into line by the 1,500-degree firing temperatures. The slabs’ surfaces are handled loosely like highly energized abstract paintings — swirling, shifting and folding — except their materials range from vitrified, transparent finishing glazes to porously mat skeins of swirling, chalky slip. In terms of ceramics, Mess’ casual boldness is remarkable. But I like his works even better when I think of them as paintings. And on the wall, they look and act like paintings. The best thing about “Layers,” however, is the contrast between Mess’ wall pieces and his “Landfill” sculptures. 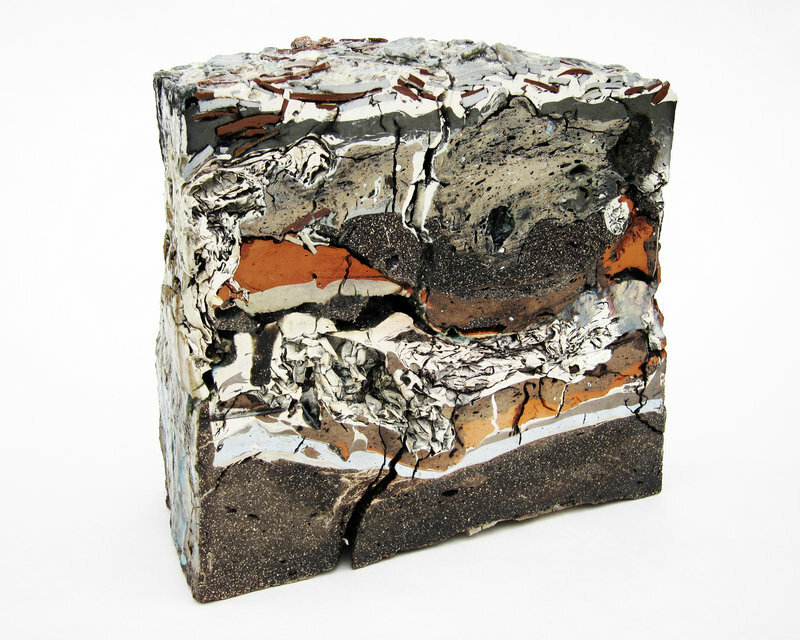 These are wondrously strange objects built up as solid chunks of ceramic in dozens of layers of clays, glazes and stains, much of which are recycled. The works are particularly interesting because they aren’t simply the products of an imitation-oriented artistic process like painting. Much of their look is the result of actual mineral transformation brought about by natural processes such as drying and firing. While the philosophical drivers behind Mess’ work haven’t changed much (but don’t underestimate the cake thing — think Wayne Thiebaud), they tend to overshadow the fact that Mess is an excellent sculptor with an eye to painting as much as three-dimensional art. Hidden in his ceramic objects is a solid and sophisticated painterly sensibility that we rarely notice because we’re so distracted by the visual indulgence of the material. It’s interesting to compare Mess’ ceramics to collective member Jody Dube’s Escher-esque vessels. Dube’s are dramatic like well-performed theater, while Mess’s feel more like scientific revelations. I like them both. I also think Dube’s pictorial works are amongst the strongest in the gallery. They aren’t afraid of decorative logic or making fun of 2-D images as “decoration” rather than practical objects — like the wit of his flat mug forms on textured grounds. I particularly like his elegantly swooping collage painting that is not ashamed of being nothing more than beautiful. In general, the members are pretty strong for an artist collective. I particularly like Julie Vohs’ small but colorfully intense encaustics, Frank Valliere’s oil pastels and prints of barns, and the moodier (and smaller) landscapes by Mary Brooking. Mess’ work alone is worth a trip to Saccarappa, but the space is nice, and there is a quite a bit of art to see. I wonder what Mess’ wall slabs and sculptures would look like to the public if they were installed with plenty of breathing room in galleries like Caldbeck or June Fitzpatrick, or if they hung next to contemporary paintings in the Portland Museum of Art. That’s where they belong.